MIAMI--(BUSINESS WIRE)--Crystal Lagoons Corporation, the multinational developer of the world’s largest man-made, crystal-clear lagoons, is bringing its patented technology to U.S. shores with the announcement of its first U.S. project in Florida at Tradition Florida in St. Lucie County. Crystal Lagoons is changing the real estate paradigm with proprietary technology that allows for the low-cost construction and maintenance of immense, recreational lagoons surrounded by sandy beaches that add significant value to real estate projects. The lagoons can be utilized year-round, even in cold climates in which they can be frozen and used for winter sports such as ice skating and hockey. Developers enjoy a direct benefit through heightened sales velocity, unit size and densities, and the transformation of non-viable land or stalled developments into viable projects. The amenity is also appealing due to its eco-friendly and sustainable technology that uses up to 100 times less chemicals than conventional swimming pool systems and requires less than two percent of the energy used by traditional filtration systems. The Boston Consulting Group estimates over 2,000 potential U.S. lagoon projects and valued the company at $1.8 billion after 3 years in operation. In 2014, Crystal Lagoons will launch Phase I of a lagoon at the master-planned community Tradition Florida in Port St. Lucie, Fla. Phase I includes the construction of an 8.5-acre lagoon. 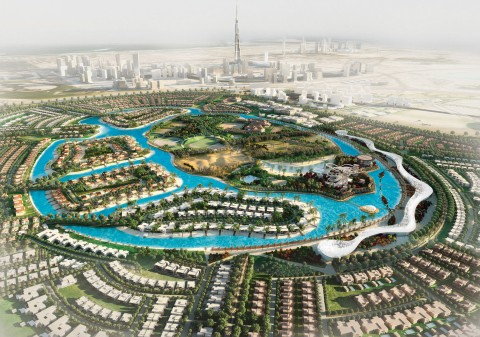 This project follows the company’s recent announcement of the world’s largest lagoon in Dubai, which when completed will be about 90 acres and top the company’s current largest lagoons at Citystars Sharm El Sheikh, Egypt, and at San Alfonso del Mar in Chile -- the Guinness World Record holder for largest swimming pool by area. The Chilean-based company, founded in 2007 by biochemist and real estate developer Fernando Fischmann, enjoys a portfolio of over 250 projects in more than 50 countries. Crystal Lagoons Corporation is an international innovation company that has developed and patented technology that allows for the low-cost construction and maintenance of unlimited size, crystal-clear lagoons. Patented in 160 countries, Crystal Lagoons’ technology applications range widely from its recreational business, which brings the dream of beach life anywhere in the world, to its industrial variations in closed-circuit cooling, water desalination and mining industry applications. In 2007, biochemist Fernando Fischmann founded Crystal Lagoons, which has seen exponential growth and is involved in over 250 projects in more than 50 countries, including the United States, Egypt, United Arab Emirates, Thailand and Chile. The Crystal Lagoon at San Alfonso del Mar in Chile holds the Guinness World Record of largest swimming pool by area. For more information, visit www.crystal-lagoons.com. Crystal Lagoons Corporation, the multinational developer of the world’s largest man-made, crystal-clear lagoons, is bringing its patented technology to U.S. shores.